Panzer has been a blood donor for AEC since February 2012. 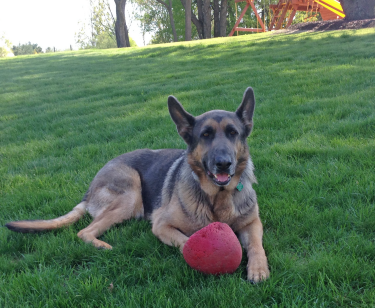 Panzer is a beautiful, big but somewhat klutzy German Sheperd that came to Michigan from a rescue group in Indiana. He is awesome around kids and very lovable. "I get so excited when mom opens the car and I can jump right in... then I figure out I'm going back to AEC to donate blood. Uh oh - well, I still have fun!" Panzer has donated multiple times at both AEC office locations, and even received a gift card from one family whose dog he helped save!